It seems there’s no limit to the lengths bloggers will go in the name of beauty. They’ll blend their foundation with socks, paint their faces with pooh emojis, make mascara out of Oreos and shave their faces with a razor. But never have we seen a level of dedication to beauty as high as Australian beauty blogger, Stephanie Lang, who pulled off a brave new trick to get thicker brows. 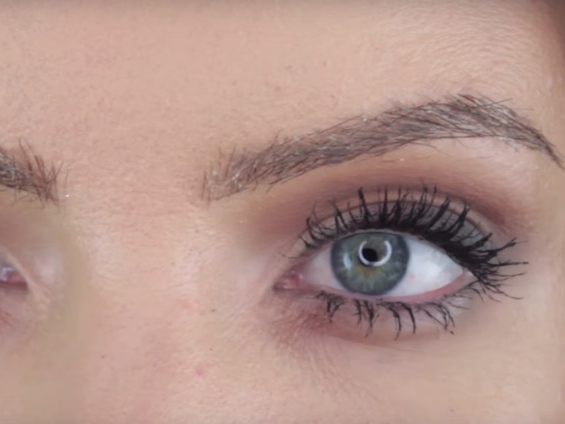 In her 5 minute Youtube video, Stephanie trims the end of her hair and then painstakingly places each individual hair where her brows are sparse to create more volume and the perfect eyebrow shape for her face. ‘I’ve tried brow tattooing before, and I’ve tried pretty much everything else there is to make my actual eyebrow hairs grow back, but nothing has really worked for me’, she explains after admitting that she initially thought of applying false eyelashes to the areas, but then had a light bulb moment when she realised the ends of her hair mimicked those on her brows. ‘My false lashes are all black, and black would have looked pretty dark considering my hair colour’, she says. Stephanie then proceeds to trim the ends of her hair, placing them on a cotton pad so that she can see them easily and then applies each one with lash glue and a pair of tweezers to make them stay in place. As expected, they initially look a bit of a mess (it’s her first foray into this particular hack), but after tidying up with a brow pencil and clever placed strokes, the brow result is actually quite pleasing. ‘I actually don’t think it looks that bad. In fact, they look very, very similar to the natural brows I used to have before I plucked them all off,’ she says, happily showing off her fuller, thicker brows. Personally, we’re quite happy with the results of microblading.